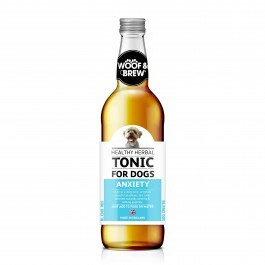 What is Woof & Brew Anxiety Herbal Tonic? Woof & Brew Anxiety is ideal for using as a daily natural calmant for anxious or nervous dogs, or before stressful situations such as fireworks or car journeys. Skullcapis a vitamin packed herb known for its calming properties. It helps with restlessness & anxiety and is particularly effective with helping to ease the panic and trembling associated with fears & phobias. Devil’s Clawcontains large amounts of iridoid glycosides, making it ideal to help support muscles and joints, along with other signs associated with aging. Astragalusis well known for supporting the immune system – anxious and stressed dogs tend to have a supressed immune system and are prone to picking up infections. Lime flowersare a natural calmant that help with stress, tension and anxiety. It also helps to support general muscle movement and blood pressure. Orange flowerspromote emotional balance and have calming and soothing properties. Lavenderhas been used for centuries as a natural calming and settling herb – not only for animals, but for people too! Lavender helps dogs cope with modern life, as well as stressful situations & travelling long distances. 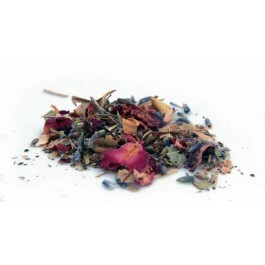 Rose petalsare not only calming but promote an uplifting, positive feeling. This is beneficial for dogs that feel anxious but is also good for dogs that a feeling down and depressed. This product would be suitable for dogs who become nervous during kennel stays. What are the benefits of using Woof & Brew Anxiety Herbal Tonic? What is in Woof & Brew Anxiety Herbal Tonic?